AzhwAr says that it is not that emperumAn redeemed the worlds from mahAbali. If a person surrenders to him and if there is enmity between this person and his follower, not withstanding his own words “na kshamAmi” (I will not forgive the enemies of my followers) emperumAn will unite the person who has surrendered with his followers. There was once a snake by name sumukan. 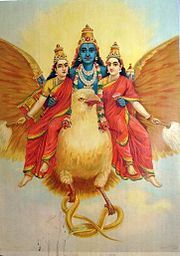 While garuda, a nithyasUri (permanent dweller of SrIvaikuNtam) and emperumAn’s vehicle, wanted sumukan as his food. sumukan, upon hearing this, got frightened. He went to indhra lOkam (the world of indhra, who is the head of celestial entities) and surrendered to emperumAn who was sitting on a throne there at that time, by coiling himself on the leg of the throne. This is all that is required for one who wants to surrender. Just as the rishis told SrI rAmA in SrI rAmAyaNam AraNya kANdam 1-20 “thE vayam bhavathA rakshyA: bhavadhvishayavAsina:” (we, who are living in your country, are to be protected by you), all that is required is to be within the boundary of the place where emperumAn blesses his followers. garuda, who went in search of sumukan, saw him near the throne of emperumAn and asked him to give sumukan as his food. emperumAn responded saying that he cannot give up one who has surrendered to him. garuda, becoming angry, let out a few harsh words typical of confidential servants (such as “is this the gift you are offering to someone who has been bearing you all along?”). emperumAn calmed him down and gave garuda the responsibility of protecting sumukan. garuda wore sumukan around his neck like an ornament and protected him. AvArO AL – will they become servitors? aduththa kadum pagai – enmity which is very closely related. Starting from their birth, there has been enmity between garuda and snakes. The fight started between garuda’s mother vinathai and snakes’ mother kathru. kadum pagai – the enmity is such severe that if the name of one person is mentioned to a person on the other side, the other person will end his life. ARREn enRu Odi – sumukan, fearful of such garuda, ran away saying that he cannot stand against garuda in a fight. paduththa perum pAzhi sUzhndha – sumukan coiled around the leg of emperumAn’s cot which was appropriate for emperumAn. Words such as pAyal, pAzhi, pAsi refer to cot. vidaththu aravai – emperumAn saved that sumukan who is poisonous. Did sumukan have any qualities such as samam (controlling mind) or dhamam (controlling the external senses)? Even among enemies one may across one with good qualities (such as vibhIshaNa). But sumukan is not like that. SrIvishNu purANam 5-7-72 says “sarpajAthiriyam krUrA:” (the species of snakes are cruel). This implies that sumukan is not one on whom emperumAn would shower his grace. vallALan kai koduththa – there is none as skillful as emperumAn when it comes to protecting those who have surrendered. emperumAn told the person who sumukan was scared of and came running to him, to protect him after giving sumukan to him. Just as people remove the poison through the snake which injected the poison in the first place, emperumAn made the enemy of sumukan (garuda) to protect him. Did not emperumAn [as SrI rAma] make sugrIva mahArAja who said in SrI rAmAyaNam yudhdha kANdam 17-29 “vadhyathAm” (let vibhIshaNan be killed) to say “asmAbhi: thulyO bhavathu” (let vibhIshaNa be equal to us)! By handing over sumukan to garuda and protecting him through garuda, emperumAn ensured that his words in varAha purANam “na kshamAmi” (I will not tolerate the enemies of followers) and in SrI rAmAyaNam yudhdha kANdam 18-3 “na thyajEyam” (I will not give up on those who surrendered) rang true. mA mEni – this refers to the greatness in the divine physical form of emperumAn after protecting sumukan. In SrI rAmAyaNam yudhdha kANdam 1-83 it says “kruthakruthya: thadhA rAma:” (only after coronating vibhIshaNa SrI rAma felt that he had carried what he had intended to)! mAyavanukku – emperumAn is most wondrous. he cannot detect himself, the boundary for the bias that he has towards his followers. allAdhum AvArO AL – can one become a servitor to anyone other than emperumAn? Those who are servitors to other deities have to look after their protection themselves. Isn’t it only emperumAn, who takes it upon himself to take charge of the protection of a person who has surrendered to him, who should be attained! Hasn’t nammAzhwAr mercifully said in thiruviruththam 27 “sEmam sengOn aruLE” (our protection is only through the mercy of emperumAn)! We shall take up the 81st pAsuram next. This entry was posted in iyaRpA, mudhal thiruvandhAdhi on August 29, 2017 by T N Krishnan.